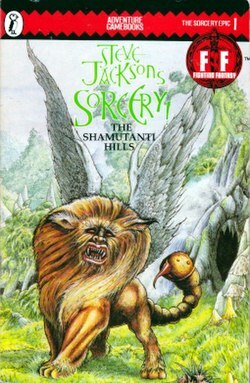 Cover of The Shamutanti Hills (1983). Sorcery!, originally titled Steve Jackson's Sorcery!, is a single-player four-part adventure gamebook series written by Steve Jackson and illustrated by John Blanche. Originally published by Penguin Books between 1983 and 1985, the titles are part of the Fighting Fantasy canon, but were not allocated numbers within the original 59-book series. Sorcery! was re-published by Wizard Books in 2003 and recreated as the Sorcery! video game series by Inkle. The Sorcery! series was published by Penguin Books (and later by their Puffin Books imprint) as four individual titles, beginning in 1983 with The Shamutanti Hills, followed by Kharé: Cityport of Traps and The Seven Serpents in 1984, and The Crown of Kings in 1985. Each title could be played as an individual adventure or as part of the overall story arc. The series was supported by the Sorcery! Spellbook, published in 1983, which was eventually incorporated as an appendix into the four titles in later printings. A boxed set titled Sorcery! was released, containing both The Shamutanti Hills and the spellbook. The series was reissued by Wizard Books in 2003. Sorcery! features several mechanics not present in previous Fighting Fantasy gamebooks. The principal difference is the ability to choose between playing as a warrior or a wizard. As a wizard, the player is weaker in combat, but has access to 48 spells, with each appearing as a three-letter word that has to be memorised by the player. Examples include ZAP (creates a lightning bolt from the finger) and HOT (creates a fireball). When given the option to cast spells the player is presented with a small selection of these three-letter words to choose from; the player is encouraged to choose from these without consulting the spell listing. It is also possible to fail to cast at all, as false spell words are placed alongside correct choices. Many spells also require a certain item (e.g. GOB requires one or more goblin teeth). If the character does not have the necessary equipment then the spell fails. All spell choices, irrespective of the outcome, incur a Stamina penalty. Warriors and wizards share the ability to call on the character's patron goddess, Libra, once each adventure. The goddess can perform a range of services, such as restoring lost Skill/Stamina/Luck points or curing a curse, or in specific locations, providing an automatic escape from that situation. The series features strong continuity: it is possible for a reader to use the same character – complete with any upgraded abilities and equipment – through each of the titles, and also use hidden clues found in one title to assist with a situation in another. Each title also features dice images at the bottom of each page, making it possible for the player to randomly "flick" through the pages for the equivalent of a dice roll. Your search for the legendary Crown of Kings takes you to the Shamutanti Hills. Alive with evil creatures, lawless wanderers and bloodthirsty monsters, the land is riddled with tricks and traps waiting for the unwary traveller. Will you be able to cross the hills safely and proceed to the second part of the adventure – or will you perish in the attempt? Details the player's attempt to navigate the hills and plains surrounding Analand while defeating various monsters and avoiding traps. Relates the player's attempt to pass through the city of Kharé and find the four lines of a spell required to open the Northern Gate and allow an exit from the city. The player crosses the Baklands, a vast and dangerous wasteland, attempting to find and defeat seven magical serpents: servants of the Archmage who are travelling to warn their master of the Analander's approach. The final adventure details the player’s attempt to find and penetrate Mampang Fortress – stronghold of the Archmage – and defeat the enemy before reclaiming the Crown of Kings. The first three gamebooks in the series were converted into 40-page d20 System multi-player role-playing adventures by Jamie Wallis. They were published by Myriador in 2003 and 2004 respectively, and reissued in pdf format by Greywood Publishing in 2009. The fourth and final installment was never released. The gamebook series have been ported to computerized media as Steve Jackson's Sorcery! by Inkle. The first part was released for iOS in 2013, and by 2016 all four parts were available for iOS, Android, and Steam (on Mac and PC). ^ Jackson, Steve. The Sorcery Spell Book, Penguin Books, 1984. ^ "SFandFantasy.co.uk - Fighting Fantasy - d20 Role Playing Game Conversions". Retrieved 10 August 2017. ^ "Fighting Fantasy d20 - RPG Geek". Retrieved 24 August 2014. This page was last edited on 22 February 2019, at 18:43 (UTC).